Mahadeviyakkha lived in the 12th Century in the south of India. From an early age she was initiated into the worship of Shiva. She considered this initiation to be the most important moment of her life and she became a devoted worshipper of Shiva. The form of Shiva she worshipped was known as Chennamallikarjuna., which translates as ” The Beautiful Lord, white as jasmine.” Much of Mahadeviyakkha’s poetry refers to her vivid descriptions of her beautiful Lord. And indeed she always signed her poems O Lord White as Jasmine. Legend says that the local Jain King of the area desired Mahadeviyakkha for she was a woman of un-surpassing beauty. Her family naturally agreed, and perhaps were a little fearful of incurring the King’s displeasure should Mahadeviyakkha be uncooperative. The wedding is said to have taken place (although some scholars dispute this) however Mahadeviyakkha was unwilling to reciprocate the desire of the King. 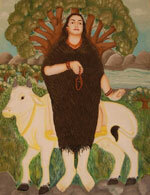 Mahadeviyakkha was immersed in devotion to her Lord and she could not accept a life of servitude to an atheistic King. Her family were highly critical of her ‘unorthodox’ behaviour and this led Mahadevia to renounce her worldly life. Mahadevi left her marriage and place of birth to live the life of a wandering mendicant. Mahadevi is said to have worn only long tresses. She felt clothes were a needless adornment for one seeking the Lord. Mahadeviyakkha is said to have then travelled to the region of Kalyana. Kalyana was a refuge for genuine Shiva bhakti, it stood out from the normal religious and social customs of the time. One of the leading saints Basavanna is said to be one of the first socialists because he spoke out against the inequities of the caste system. But primarily Basavanna and Allama were uniting those dedicated to Shiva worship. However even the leaders of this community Basavanna and Allama had some trouble accepting Mahadevi, they were somewhat disturbed by her naked appearance. However Allama was eventually impressed by both her humility and genuine spirituality and Mahadevi was accepted into the community. that even the feathers do not show. that the bones must be crushed to crumble. Despite her years of great tapas Mahadevi still had not had the ultimate experience of merging into the infinite – into her Chennamallikarjuna. It is said that towards the end of her life she retreated to the cave where her last desire was fulfilled. Merging into the infinite she quietly left the earthly stage, leaving behind a legacy of illumining poetry. The life of Mahadeviyakkha to some extent mirrors that of Mirabai. Both female saints had to renounce the comforts and expectations of a family life. Both suffered censure and displeasure from parts of society who didn’t appreciate their devotion to spirituality. However despite the difficulties both faced, the intensity of their divine intoxication is startlingly revealed in their poetry.